In remote villages like Jayuya, Puerto Rico, many house still needs to be repaired. The blue plastics roof where provided by FEMA in most cases, but also by NGOs. 2018. Photo: Fernando Briones. When is the eruption of a volcano a natural disaster? You may be thinking what I was when Fernando Briones asked me a similar question: always. But Briones has a different answer: sometimes. 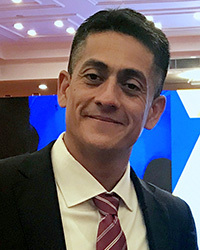 Briones, a recent research affiliate with the Center for Science and Technology Policy Research (CSTPR), argues that a natural hazard only becomes a natural disaster when affected people are around. Briones has a PhD in Social Anthropology from The School for Advanced Studies in Social Sciences, in Paris, France. He is primarily interested in how people are managed or manage themselves before and after natural disasters affect their communities. He argues that being vulnerable to a natural disaster is the result of social vulnerability as much as geographic vulnerability. This boy grows up in shelter with his mother, one year and half of the Hurricane Maria. Scotts Head, Dominica. 2019. Photo: Fernando Briones. Currently, Briones is studying the aftereffects of Hurricane Maria, the hurricane that struck Puerto Rico in 2017, devastating the region and leaving people without adequate power and shelter for months. It was an ongoing, aggravating news story in the United States—but most of us were unaware of the true extent of the hurricane’s devastation. The Commonwealth of Dominica is an island country in the West Indies. It was also hit by Hurricane Maria, and has not recovered as well since. Smaller and poorer than Puerto Rico, it also does not have the economic advantage of being a territory of the United States. Federal resources were fewer and farther between, and the long-term effects of that lack of resources are still being felt. Many people displaced from housing in Dominica are still living in shelters—arrangements that were really meant to be temporary. “I found in Dominica that people stay in the shelters for one and a half years,” said Briones. “It sounds horrible, but those people are going to die sooner than the life expectancy.” Living in a shelter is demoralizing, depressing, and economically punishing. “Being in shelters is a waste of a generation,” Briones concluded. Briones is researching these circumstances, particularly in comparison to Puerto Rico, which had a larger influx of foreign aid. He’s especially interested in how people first respond to a disaster, before there is a response from government institutions. A large number of homes remain in ruins along the island. Petite Soufriere, Dominica. 2019. Photo: Fernando Briones. With a “boots on the ground” approach—talking to citizens directly affected by the crises—Briones is compiling an incredible wealth of knowledge about these early responses. 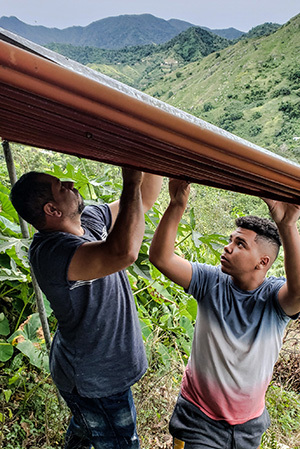 He’s currently collecting this qualitative data in Puerto Rico and Dominica such that he can compare the two disaster responses, “in order to prepare better preparedness systems and resilience, and to understand vulnerability,” said Briones. Previously at CCB/INSTAAR (sponsored by Alumni TIES program in Puerto Rico) and now at CSTPR, Briones is working with Max Boykoff to develop a proposal for this work. He’s also collaborating with CIRES, making the project extensively interdisciplinary. Moreover, his collaborations in Dominica, for example with the Minister of the Environment, ensure that his research will directly help people in vulnerable areas of society. In particular, he wants to draw attention to the fact that a vulnerable population made Hurricane Maria much more devastating. Father and son installing a water collection system, using their own knowledge and materials. Jayuya, Puerto Rico. 2018. Photo: Fernando Briones. Briones is also a photographer, so apart from this research, Briones spent some of his time in Dominica taking pictures. 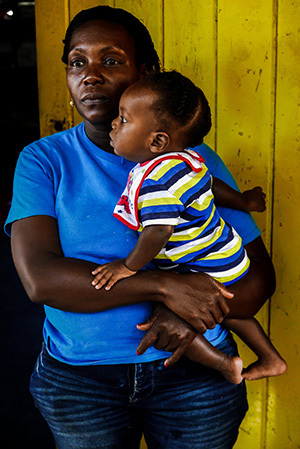 The results, stark photographs of people and places in Dominica ruined by the hurricane, are particularly devastating. Briones hopes that it is a combination of research, storytelling, and pictures like these that will get the story of Dominica as much attention as the story of Puerto Rico—that might not be much, but it will help. A hurricane in the middle of the Atlantic Ocean isn’t a disaster—it’s just some clouds and wind in a funnel. But when that funnel touches down on land, displacing thousands of vulnerable people, and disrupting communities on a long-term scale—that’s a disaster. The distinction is important because it changes the equation: humans can’t stop the hurricane, but with the right information and the right actions pre- and post- landfall, they can mitigate the disastrous consequences. ← Should We Hope for Power to Declare a National Climate Emergency?